When comparing NSF® Certified Water Purifiers to Non-NSF® Certified Water Purifiers note there are countless UV water purifier brands to choose from. Although many brands are made outside the USA, there are still some manufacturers holding onto this market in America – with Atlantic Ultraviolet Corporation® being one of these manufacturers (in the UV business since 1963). Over the years, we have developed a wide-range of different brands of ultraviolet water purifiers – namely, Bio-Logic®, MINIPURE®, MIGHTY★PURE®, SANITRON® and MEGATRON®. Each brand has its own set of features, and several models handling a range of flow rates. Typically, customers know (or figure out with some help from one of our UV Application Specialists) the gallons per minute that need to be treated. Once that is determined, the field of choice is narrowed down. Based on what features are needed, a specific model is chosen. 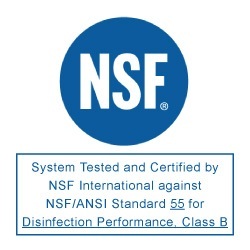 In recent years, some requirements call for the water purifier chosen to be certified to a third party standard – most notably, NSF®/ANSI Standard 55: Ultraviolet Microbiological Water Treatment. NSF® is the National Sanitation Foundation, a not-for-profit organization located in Michigan that is ANSI accredited organization devoted to public health safety and environment protection. Some state and regional regulators will require NSF® certified UV water purifiers be installed. If this is the case, we offer our MIGHTY★PURE® Ultraviolet Water Purifier 12 gpm and 20 gpm units that are certified to the NSF®/ANSI Standard 55 Class B (includes material safety, structural integrity, product literature and UV performance). If NSF®/ANSI Standard 55 is NOT required, you can choose from the array of equipment available and save money since certified units always cost more. 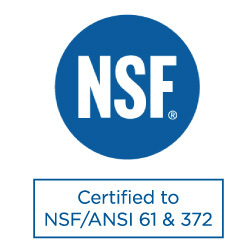 NSF®/ANSI 61 is a set of national standards that relates to water treatment and establishes stringent requirements for the control of equipment that comes in contact with either potable water or products that support the production of potable water. NSF®/ANSI 372 was set in 2011 to establish procedures to meet the 0.25% lead content requirement of the RLDWA (Reduction of Lead in Drinking Water Act) using a wetted surface area average calculation or just simply using all no-lead materials for areas in contact with drinking water. NSF®/ANSI 372 includes a broader scope of drinking water products covered by the law which may not be covered under NSF®/ANSI 61 and enables large or complex products and assemblies to achieve certification. Atlantic Ultraviolet’s SANITRON® line of water purifiers, 12 gallons per minute (gpm) and higher, have been tested and certified to NSF®/ANSI 61 and NSF®/ANSI 372.